As an anti-minimalist, Bryan Scary creates his own musical world using complicated layers of instrumentation, a whirring imagination, and the occasional prop. 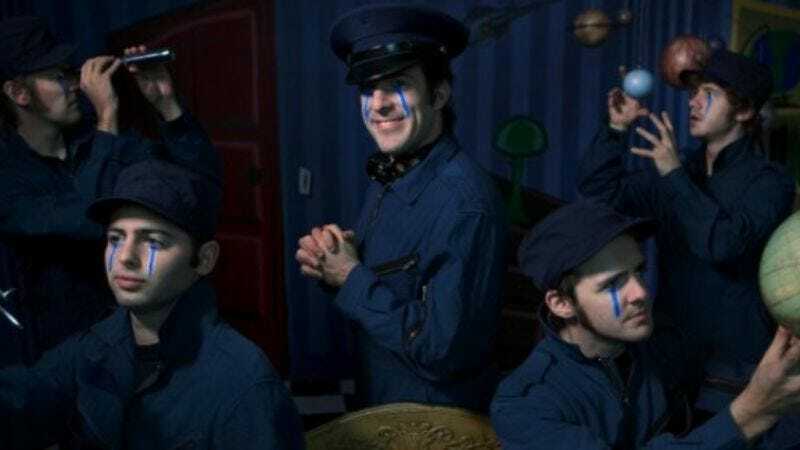 Together with his band The Shredding Tears, Scary concocts bombastic, conceptual pop songs that ring with the echoes of David Bowie, Queen, and ELO. The band is on tour promoting its latest EP, Mad Valentines, which—unlike Scary's acclaimed debut—wasn't recorded entirely alone in his apartment as a calling card to potential band members. Ahead of the band's performance Tuesday, Nov. 10 at The Black Cat, Scary spoke to The A.V. Club about how his impatience led to a musical career, paring down the band's wardrobe, and Perez Hilton. The A.V. Club: Your music and live performances include a lot of theatrical elements. Were you a drama club kid in high school? Bryan Scary: I was involved in a lot of theater. I wouldn't call it "drama club," but I did a lot of acting. I was always writing stuff, and I come from a film and theater background. BS: I went to film school, and that's definitely a big part of where the music's from. I got kind of disillusioned with film partly because of school, and because there was a disconnect for me from conception to execution. I didn't have the patience to come up with an idea and basically wait a year or however long it would take to make a film. Music is a much more visceral and immediate art form. Though it has its drawbacks, you can just get onstage and express yourself. AVC: Is your film background where these layered concept records come from? BS: The only one that's really been a concept record has been the last full-length [Flight Of The Knife], which is about not just space, but flight in general. It was a thing that was showing up in all the songs, and I thread them through this line that involves moving from childhood and innocence to more cynical adult ideas at the end of the record. AVC: But you've said your next record will be a Western? BS: We have our new full-length ready to go … It involves a lot of bandits and con artists and stories from the turn of the Industrial Revolution. AVC: The band seems to have a theme as well—saying you're from Scaryville, USA, and wearing costumes onstage. BS: It's kind of a way to encapsulate the world of your band and your music and give it a name and an identity. I like the idea of a band that's bigger than just the music and has its own mythology. As a fan of bands who do that, I really appreciate it. It's supposed to be fun and funny at the same time. AVC: You found some of your bandmates through Craigslist. Did they latch onto the dramatic aspect of your performances right away? BS: Everyone was pretty game for whatever. We've scaled back on a lot of the makeup and a lot of the onstage theatrics because they were unfortunately painting us in a light that I wasn't super-happy with. People turn away when you're wearing costumes, and have a harder time accepting you as a strong musical force of some kind. AVC: The band used to wear jumpsuits onstage. What are you wearing for this tour? BS: It's color-coordinated and has a vibe to it, but we're all wearing different things that are somewhat related to [Mad Valentines]—different shades of reds and whites and pinks. Way less costume-y. AVC: If you had the chance to frighten someone, who would it be and how would you do it? BS: I'm sure I've frightened a lot of people. It would have to be someone who was somewhat of a square, I guess—frighten someone out of their complacence. My childhood librarian when I was growing up. I would love to frighten her and have all the books fall off the shelves. There'd be nothing she could do about it—she can't talk, she can't move, she just has to watch it happen, and then we put on a whole concert in the library. AVC: Early in the band's career, you found a fan in celebrity blogger Perez Hilton, and you're about to have a song in Rock Band. Did you ever anticipate that kind of publicity? BS: With Perez Hilton, it was weird when it happened. I didn't know anything about him, but I knew something was weird. I went to the MySpace page that evening his thing ran, and there were friend requests from all these women, and I got e-mails from every woman I'd ever known. I was like, what the hell is going on here. And Rock Band, I think it's great. I'm actually curious because they chose a song ["Andromeda's Eyes"] that's really difficult to play. I'm definitely going to try to play that song. Is there a keyboard in Rock Band?